How to Easily Master Format ASUS ZENFONE 3 ULTRA ZU680KL with Safety Hard Reset? Tips and tricks when ASUS ZENFONE 3 ULTRA ZU680KL get problems. This is dual simcard GSM-GSM Android smartphone using Android Marshmallow as factory default operating system. The LCD screen is 6.8 inches which is not too much different with 7 inches tablet. That is why we call it as ULTRA with ultra screen size and battery capacity. Find more information about review and solutions when ASUS ZENFONE 3 ULTRA ZU680KL get some problems. Camera is one good thing at ASUS ZENFONE 3 ULTRA ZU680KL because it have 23 megapixel with fast accurate laser autofocus. Dual LED will give more natural color when we use the light flash help. If we are heavy users and need to install many applications, it is better to buy ASUS ZENFONE 3 ULTRA ZU680KL with bigger internal memory capacity, because all installed applications by default will use internal memory for store apps and data. How to backup data or Contact at ASUS ZENFONE 3 ULTRA ZU680KL? Backup all important data when we have time to do that, because we never know when our ASUS ZENFONE 3 ULTRA ZU680KL will get any trouble. We can use microSD external card to copy or move important files using File Manager applications. If our ASUS ZENFONE 3 ULTRA ZU680KL has already signed in with Google account, by default our contact will be synchronize in the background to Google server. Please make sure we check all contact at Google contact server using Internet browse to make sure backup is done. ASUS also have backup applications from Google Play Store which is free to download for all Asus users. Find at Google Play Store using keyword ASUS BACKUP, and choose from ZenUI, ASUS Computer Inc developers. Please note, Asus Backup will not backup data file or photos or videos from internal memory, therefore we have to backup manually to microSD using file manager. Asus Backup will backup installed applications and data for that apps. Also for ASUS ZenUI apps, such as ZenUI Launcher, ZenUI Do it Later, ZenUI Contacts and ZenUI Messaging. The ASUS ZENFONE 3 ULTRA ZU680KL will continue the step until ready to use in clean factory default. Is That Any Secret Code for Doing Format ASUS ZENFONE 3 ULTRA ZU680KL ? There is no secret hidden code for ASUS ZENFONE 3 ULTRA ZU680KL to make it back to factory default. Do the options above to hard reset it. 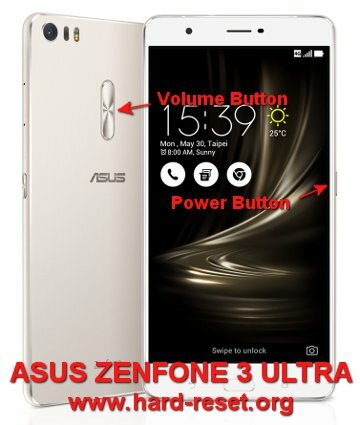 How to Format or Erase Phone Memory at ASUS ZENFONE 3 ULTRA ZU680KL ? There are two phone memory type at ASUS ZENFONE 3 ULTRA ZU680KL, one is internal memory and the other one is external memory. If we want to format internal memory phone then we have to do hard reset or reformat the operating system of ASUS ZENFONE 3 ULTRA ZU680KL as well. Please use menu setting to do hard reset or reformat using #option 1 above, but make sure to give checkbox mark at Erase Internal SD card / Internal storage. Then it will reformat the factory default operating system and remove or erase any data inside internal memory. How to Make Battery of ASUS ZENFONE 3 ULTRA ZU680KL Stronger, Life Longer and Not Fast to Drain ? With 6.8 inches LCD screen, this phablet will need more bigger battery capacity. ASUS ZENFONE 3 ULTRA ZU680KL use 4600 mAh battery, this is enough to make this phablet run more then one day with standard usage. But as we know using tablet size smartphone will make us fun to do some work or watch movie or playing games, then maybe 4600 mAh battery will not enough. We have to do some adjustment to make the battery work more stronger such as set LCD screen brightness as low as possible. There are other steps that we have to disable to reduce battery usage of ASUS ZENFONE 3 ULTRA ZU680KL, by turn off all not use connections like GPS or Wifi or Bluetooth or Infrared. They still consume battery power when active although we are not use that connections. The information from this page describe about how to wipe ASUS Zenfone Ultra. If you need another resource for hard reset, use search function at this homepage or find from our related posts. How to Easily Hard Reset HUAWEI P8 (GRA-L09/GRA-L03/GRA-L13/GRA-UL00) with Safety Master Format? How to Easily Master Format HTC U11+ (PLUS) with Safety Hard Reset? How to Easily Master Format HTC DESIRE 620 / 620G (DUAL) with Safety Hard Reset?